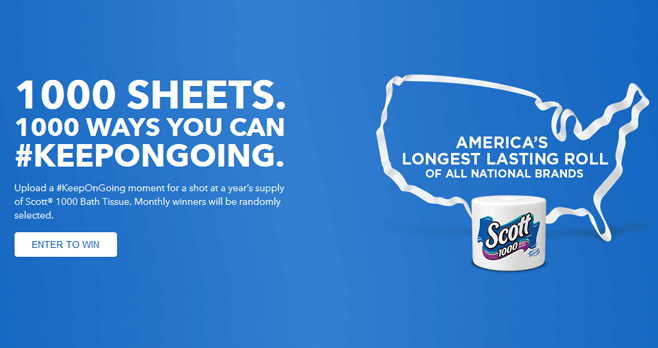 The new Scott 1000 toilet paper has 1,000 sheets per roll which makes it America’s longest lasting roll of all national brands. To celebrate, you are invited to enter the Scott 1000 Ways You Can Keep On Going Sweepstakes for a chance to win a year’s supply of Scott 1000 Bath Tissue. Want to participate? Simply take a photo or record a video that shows a moment that you want to #KeeponGoing then, upload it online at Scott1000.com. You will be automatically entered into the applicable monthly drawing and you could win Scott 1000 TP for a year. Easy, isn’t it? What You Need To Know About The Scott 1000 Ways You Can Keep On Going Sweepstakes At Scott1000.com? Eligibility: The Scott 1000 Ways You Can Keep On Going Sweepstakes is open only to legal residents of the 50 United States, and Washington, D.C. who are 18 years of age or older at time of entry. Sweepstakes Period: Begins February 6, 2017 at 12:01 am CT and ends December 31, 2017, at 11:59 pm CT.
Limit: Limit one entry per person or email address, per monthly drawing. Random Drawing: One winner for each Monthly Drawing Period will be selected on or about the second Monday following the end of each Monthly Drawing Period at random from all valid entries received during that Monthly Drawing Period by an independent Judging organization, whose decisions are final on all aspects of the Sweepstakes. Monthly Grand Prize (11): 4 cases of Scott Bath Tissue S1000. Winner’s List: For names of Prize Winners, mail a self-addressed, stamped envelope to The Scott 1000 Ways Winners, P. O. Box 735, North Branford, CT 06471 by 12/31/17. Sponsor: Kimberly-Clark Global Sales, LLC2100 Winchester Road, Neenah, WI 54956. For more information on the Scott 1000 Ways You Can Keep On Going Sweepstakes, including official rules, visit https://www.scottbrand.com/en-us/featured-products/scott-1000-longest-lasting-roll now!